This is a picture of me, my mom and my sister Amy. 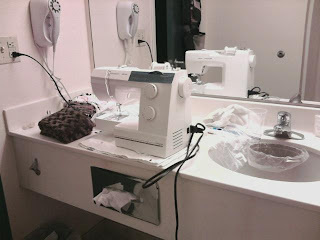 I always get asked who taught me how to sew? as well as when did I start sewing? my mom started teaching me. I would say that my mom has many obsessions er...I mean passions. One of which is sewing. She loves it. She rarely travels without a sewing machine. She is a great seamstress. If I ever get stuck on something she is the 1st person that I call. few months that her & my dad decided to go on a little trip together to get away from it all. at 6:22 a.m. I received this text from my mom. "Just like my sewing room at home, minus the toilet"
in their hotel room...the bathroom! here she is at the kitchen table sewing away. She brought 4 people in her van and had more stuff to unload then I did wit 7 of us! This is a pic of my kids after they just woke up. Take a look behind them. that my mom brought piled with all her sewing supplies. I love that she enjoys sewing so much. She has taught so many people to sew and love it. Thanks for all you do mom! Thanks! She works so hard and deserves a little credit now and then. You have many usefull skills! I can't wait to see the quilt you are working on.